This looks rock and roll, Sarah! Love it! I’m all about pimping work clothes up the best way I can so now that includes cray-cray lining, super rad pockets, natthy Hong Kong finishes, piping (my new BFF) and sassy top stitching. I say, business on the outside, party on the inside. This looks absolutely smashing on you! I always think the best thing to do is team a boring/sensible piece with a quirky piece, whether its a top/blouse, necklace etc. Balance! You’re right, I never remember to wear jewellery. Blouses might be the only thing you’ll see about here for awhile! 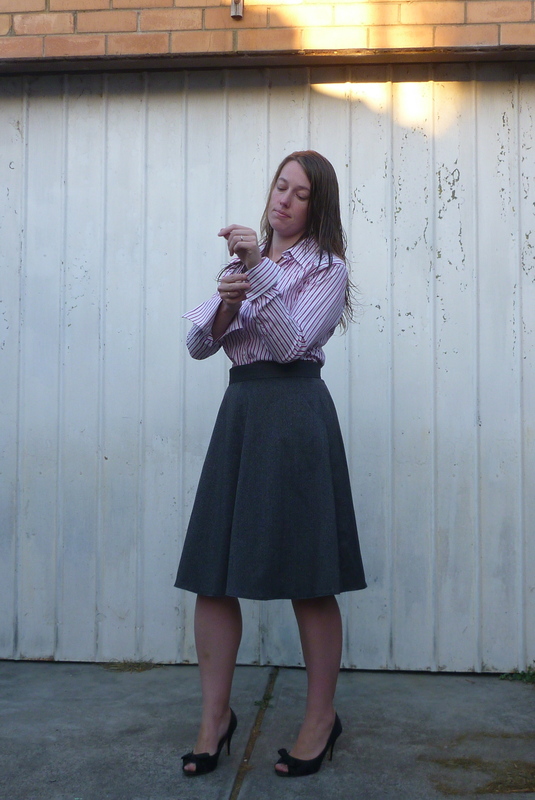 I’ve found Alma great for work, there are no buttons or fussiness and the mid-sleeves are perfect. Easy to iron too!! I never wore accessories and then I worked with someone that rocked them. So I started to experiement and now I have oodles of necklaces, hats, belts etc they are the sorts of things you pick up for a song more often than not. And they are fun! Great idea! I’ve got a mirror/accessories cupboard at my bedroom door. I didn’t have a mirror for 5 years and finally spoilt myself with an Aldi special last year. It’s awesome! I just get dressed. Open the cupboard and bam! Rings, watch and necklace on! Out the door! 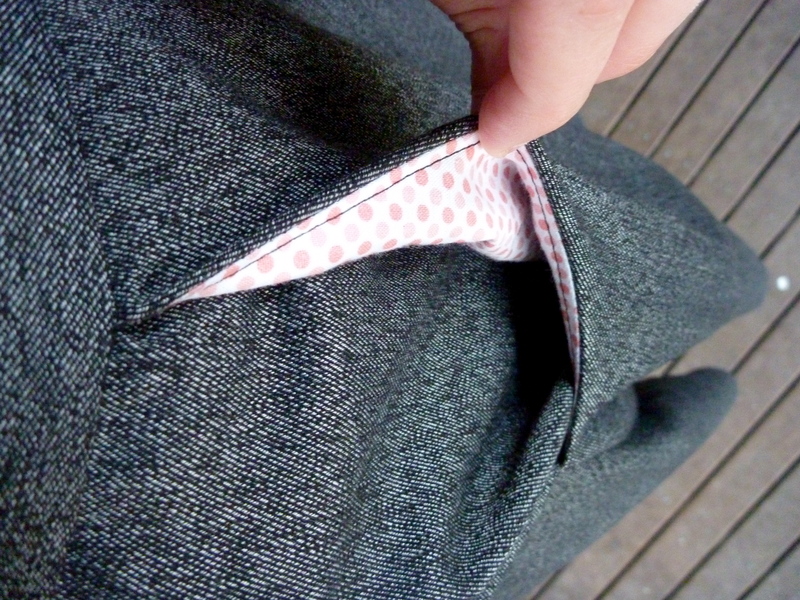 I like your spotty pockets! I also don’t think it is boring. I, like most home sewers, always say I need to make more classic clothes like this. I bet you wear it all the time. Ahhh, and there’s going to be a whole lot of truth in that. I love your skirt! The colours and texture of the wool are gorgeous! And I’m all for a bit of cray-cray in linings and pockets! Thanks! How good a fat quarters for that? Haha! This is the least maternity friendly pattern you could get 🙂 How far along are you now? This has got to be one of my favourite Hollyburns that I’ve seen so far- the drape of the fabric is PERFECT and gives the skirt such a pretty shape. Loving this skirt on you… The cut, drape of the fabric is very flattering. I wouldn’t even have thought of it as ‘boring’ until you mentioned it. I pockets are a nice touch. To add to your discussion with SewBusyLizzy, I recently brought a belt coat hanger (I didn’t know these existd either!) at Target for a song. I twisted the hook on the hanger, latched it over a door and used it to hand all my necklaces on. It works a treat! Oh, I love it. The piped pockets, the whimsical crazy pockets, the drape. Awesome. And since I went to the my messings site after replying to your note at my site, I realize you weren’t up at 5 dealing with your own deadline. Because that might be just a little crazy, right? Oooh, I love how drapey yours is! Maybe you could wear it with crazy/patterned tights? (or maybe they’re out of fashion again, and I never noticed). Otherwise, I’d agree with the accessories-recommenders. Nothing quite like a chunky/colourful necklace or earrings! It’s not boring, it’s classic. CLASSIC. But with attitude (BAM and, of course, his brother POW). The other things to tart it up are shoes and hair. I think your Hollyburn is gorgeous as it is tho! Sweet! I use contrast scraps for pocket bags too. 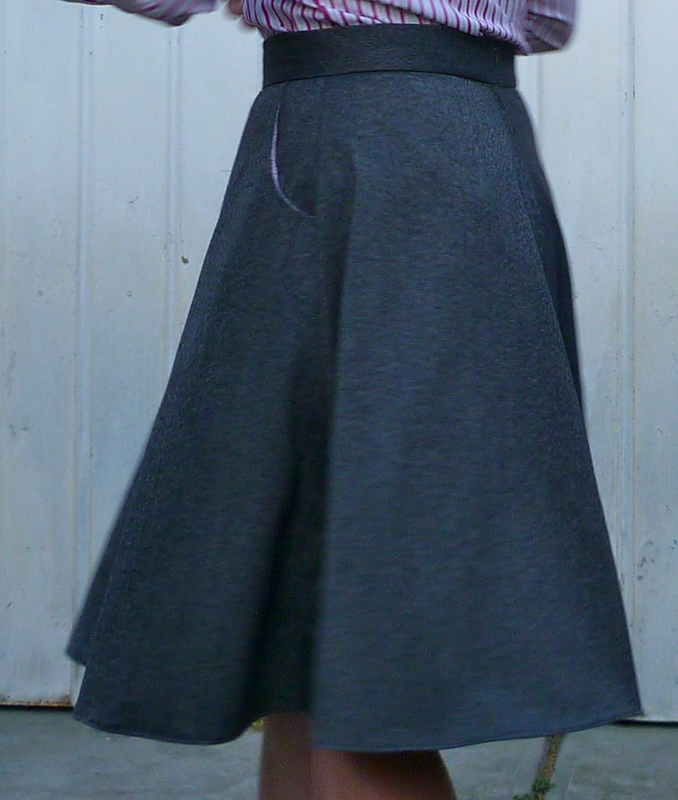 This hollyburn looks to me like a regular half/ 3/4th circle skirt with diagonal front pockets. So you could get around the pasta-lunch thing by using a curved waistband because the ends of the curve go on the bias (or half-bias depending on size/ curve) which automatically gives the wearer more ‘breathing room’ in terms of extensibility. In this case though, you’d interface the outer side. 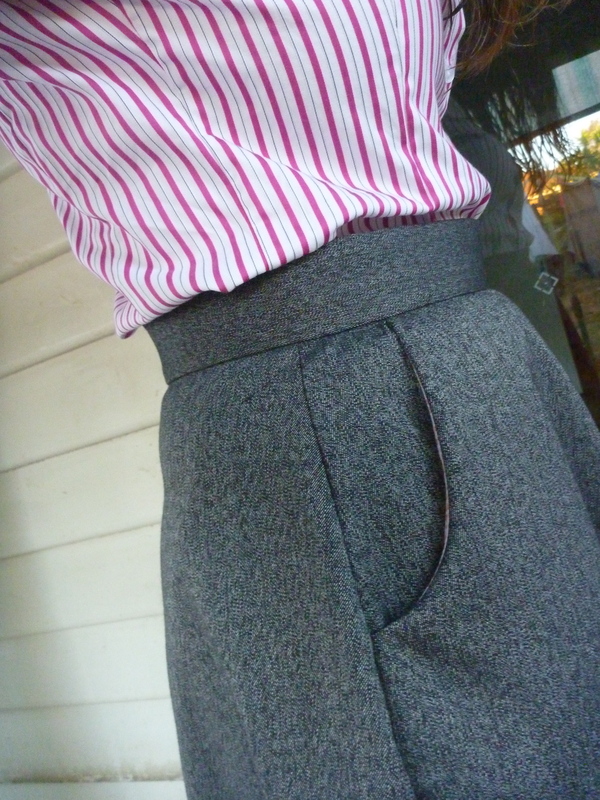 There’s plenty of tutorials online for curved waistbands but most Simplicity skirt patterns tend to include them so if you have one just ‘franken’ it together the next time you make this. Next time… hey, would you like a lift to sewcietea? hmm interesting theory I don’t know if I agree with it. This skirt for example sits on the waist and has a curved waistband. I sewed it up yonks ago and had to size up to make it sit lower (it’s about 4-5 cm away from my hips so not on them). I’d have to go two sizes up for it to sit on my hips. Burda and Knipmode also have plenty of examples of such patterns. I’m only using the Simplicity one as an example because there’s sh*tloads of reviews for it online (many of which whinge about the fact that it doesn’t get worn because the waist is so high that everything needs to be tucked in-I have the same problem with it). Sarah you really have done a lovely job with the skirt. Piping in the seams is a nice way to add a bit if detail without losing the ‘professional’ look. A vintage brooch at the waist is another way of adding beautiful detail. Oh, beautiful skirt!! It looks really lovely on you, as well. I am currently taking a college sewing course, and we need to purchase a skirt pattern with: waistband, zipper, darts/pleats/tucks and side pockets. Sounds like this one may be a winner for that criteria! (And, I could essentially cheat with the sewalong…..shhhhhhh). Lol. 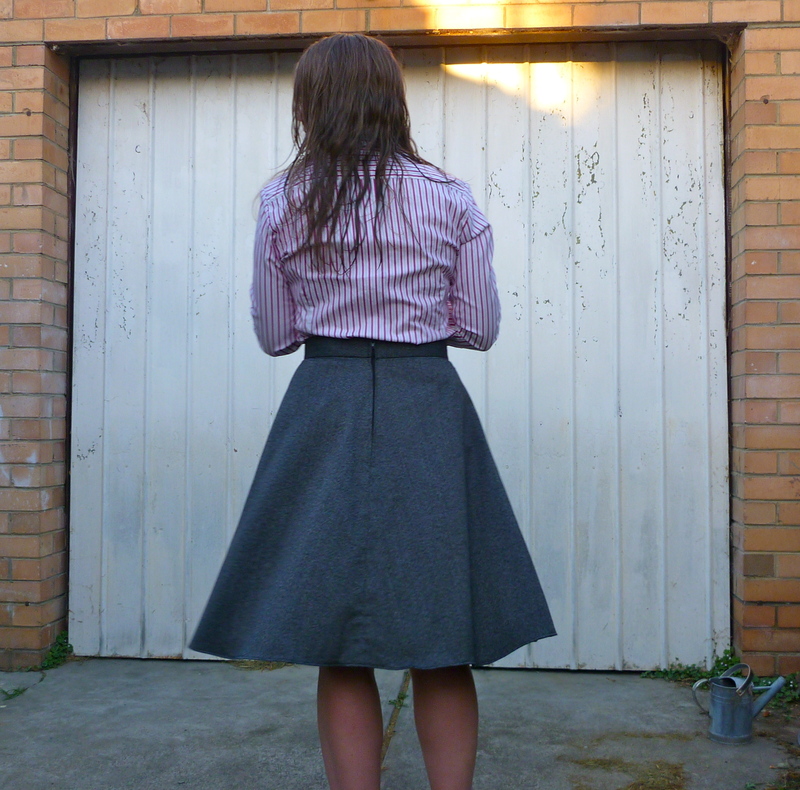 The only thing it’s missing is the darts/pleats.tucks, but this is a great beginner skirt. Otherwise, the sewaholic crescent skirt has gathering you might be able to turn into pleats?